Although out of character from my normal posts, this post is going to be about Lowes Home Improvement. Why? Two reasons. First, I had this lovely picture of my local Lowes Home Improvement store. Second, I really wanted to tell the world how addicting home improvement projects are. You see, after my husband and I moved into our first home together and were bombarded with fix it projects, he decided to go to work at Lowes down the street! Having my husband work at Lowes Home Improvement is great for so many reasons that I don't even know where to begin. He can walk to work, which cuts down on our gas bill and leaves more money for home improvement projects every month. He also gets a discount. Let me tell you, it's not a great discount, but with all the home improvement projects we do, it really can add up. I'm positive we've saved thousands from his discount. As for Lowes Home Improvement, It is so much better than the Home Depot. (That's the only competition here aside from very small local stores) The people at Lowes are always nice and helpful. I went to Home Depot the other day and asked if one of the workers worked in the area I was looking at. He simply said, "no," and kept walking. He didn't offer to find anyone, try to help in any way shape or form. I was simply to figure out my home improvement project by myself. (I was looking for cabinets for my laundry room by the way). rings, hair, trinket & bangle accessories. amount of work? I've no expertise in coding but I was hoping to start my own blog in the near future. Anyways, should you have any ideas or tips for new blog owners please share. I know this is off subject however I simply needed to ask. Many thanks! of it. Thus that's why this paragraph is amazing. Thanks! however I had to ask. Does running a well-established blog such as yours take a large amount of work? 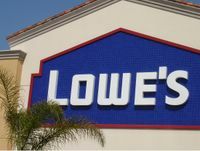 Thanks for finally talking about > "Lowes Home Improvement" < Loved it! Hello there, You have done an excellent job. I'll definitely digg it and personally recommend to my friends. I am sure they'll be benefited from this site. Awesome issues here. I'm very happy to see your post. Thank you a lot and I am looking forward to touch you. Will you kindly drop me a e-mail? It's really a nice and helpful piece of info. I am satisfied that you shared this helpful info with us. Please stay us informed like this. Thank you for sharing. Thanks for finally writing about > "Lowes Home Improvement" < Loved it! I'd like to thank you for the efforts you have put in writing this site. I'm hoping to check out the same high-grade content from you in the future as well. say I truley fancy reading your weblog. I have decided to bookmark it at digg. com with the title: Blogger: Home Improvement and your Web address: http://www. I hope this is fine with you, I'm making an attempt to give your wonderful blog a bit more exposure. Be back shortly. wondering if you know where the best place to buy a website url is? I am not even sure if that's what its known as? (I'm new to this) I'm referring to "http://www.blogger.com/comment.g?blogID=11922263&postID=111428903352844570". How do I go about getting one of these for the website I'm building? submit is simply great and that i can think you're knowledgeable on this subject. Fine together with your permission allow me to clutch your feed to keep up to date with drawing close post. Thank you a million and please carry on the enjoyable work. anything you can advise? I get so much lately it's driving me mad so any support is very much appreciated. was curious about how you got the "www" included in your domain name? "http://mydomain.com". Do you know how I can alter this? I wouldn't mind composing a post or elaborating on some of the subjects you write with regards to here. Again, awesome web site! e-mail. I've got some creative ideas for your blog you might be interested in hearing. Either way, great website and I look forward to seeing it expand over time. This put up truly made my day. You cann't believe simply how much time I had spent for this info! Thank you!